When I was approached (i.e. e-mailed) by the folks as XAPP asking if I wouldn’t mind reviewing their soda I was a bit skeptical. 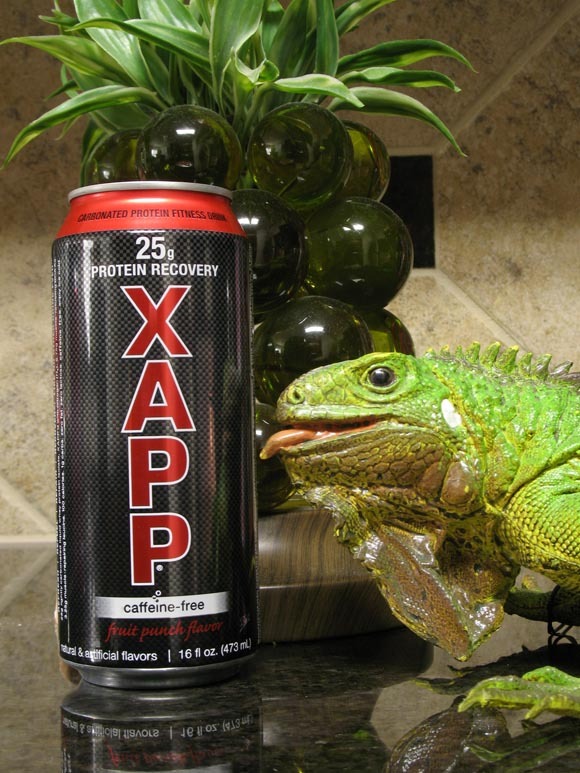 You see XAPP soda isn’t your normal soda… it’s a workout soda. What I mean by this is that it has 25g of protein in it to help you recover from your strenuous workings out. The reason I was skeptical (going back to my initial sentence) was because I’ve never known a “workout” product to taste good. Normally when I see the word “protein” slapped on a label I associate it with all those weight gain powder drinks that I tried to force myself to drink back when my family called me “Stick Boy”. Needless to say I took XAPP up on their challenge with the stipulation that I only review the flavor aspect of XAPP soda… which by the way is fruit punch. So this review will have nothing to do with how well it helps me recover from my work out. XAPP comes with caffeine and without caffeine. The caffeine version is what you’re supposed to drink pre-workout to help energize you. Since I’d like to get some sleep relatively soon I’ve opted for the caffeine-free version. Let’s open ‘er up and… wait… the ingredients of this include milk. Skepticism level raised. Any who, let’s open ‘er up and take a whiff. Well it certainly smells like fruit punch so that’s a plus. Skepticism level lowered (slightly). It’s not the strongest fruit punch aroma I’ve ever encountered but it’s enough to make me think this might actually taste pretty decent. There’s only one way to find out. Well the initial chug of the beverage is kind of pleasant. It tastes like a light and fruity punch much like the listed flavor says. The finish is what’s going to hurt XAPP soda but we’ll get to that. It’s very lightly carbonated so you’re not going to be burping up a lot of this stuff when you’re done chugging it down. I only say chugging because that to me is extreme drinking. I figure you have to be extreme to drink this because the can is decorated with the look of carbon fiber. If you’re drinking out of a “carbon fiber” can then you must be pretty extreme. You won’t be “Smug looking guy I can’t stand wearing too tight a t-shirt/necklace with slicked back hair and sprayed on confidence… I mean tan” extreme, this is an acceptable level of extreme but I digress. Back to when I said “the finish is what’s going to hurt XAPP soda…” The finish is what’s going to hurt XAPP soda. I say this because that’s when this begins to taste like a “workout” beverage. The mouth feel isn’t gritty but it’s not a pleasant one either. Texture wise it’s like the most liquidy mud you’ve ever seen. No actual granules mind you but not something you want to keep ingesting for pleasure. The more you drink it the more you mouth suffers from the buildup of this beverage. It’s almost as if XAPP soda has a mouth drying effect the more you drink it. With all that said it’s not the worst soda I’ve ever had and as far as “workout” products go I’d say it has one of the better flavors out there. TheSodaJerks don’t review products based on how well they taste in their category though. I’m not going to rank this because it tastes better than Hyper-Choco-Bo 9000. In the end, which is nearing, the ranking is primarily based on how well its taste holds up in the soda world. The initial taste really is kinda nice and if they could have held onto that flavor we’d be talking in cheerful tones right now. Sadly though the initial flavor dissipates relatively quickly into the saddest finish since Crystal Skull.